Cooley ready to concede to Harris in AG race? Los Angeles County District Attorney Steve has scheduled a 10:30 a.m. conference call where he will address “accredited members of the media.” The speculation is that Cooley will concede a loss to San Francisco D.A. Kamala Harris in the state’s attorney general race. On Tuesday, the LA Weekly called the race for Harris using a fairly straight forward ballot analysis. I just posted this on our news site, based on the latest information from the secretary of state’s office. Don’t how this news affects Cooley’s plan for a 10:20 press conference with Sheriff Lee Baca. 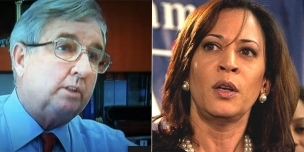 San Francisco ‘s District Attorney Kamala Harris appears headed to come-from-behind victory over Republican Steve Cooley in the race for attorney general, according to figures released Wednesday morning by the Secretary of State’s office. The latest figures released in Sacramento Wednesday morning show Democrat Harris up, despite losing in early counts. Cooley, who campaigned hard on his anti-corruption record, faltered in the late days of the campaign after Harris got a boost from President Barack Obama. Harris, who won the counties of the San Francisco Bay Area, also took Los Angeles County by a large margin and won in Imperial County, according to official results. The beauty of the ad, of course, is that Harris never said a word. She didn’t have to: Cooley was killing himself with his own words. He not only sidestepped the state’s epic pension crisis, borne out of government employees like him having been promised too much, but he compounded the miscue by griping about a salary of $150,000 a year – with the state having an unemployment rate of 12.4 percent. This should go down as one of the dumbest responses ever given in a political debate.